One of the best parts of being a fountain pen user is the vast amount of options available. Fountain pen users can choose from a wide variety of pen body types, a rainbow assortment of inks, and stacks of different paper. Once a decision has been made on all of those options, you'll still have to choose a nib size! Luckily, iPenstore has put together this helpful guide to make your fountain pen buying experience a little easier. In this guide, we've included a fountain pen nib tip size chart for all the brands we carry, as well as explanations and descriptions of the various nib types. The measurements in the chart below are from on our own measurements here at iPenstore using a digital micrometer. We measured both the actual nib tip, and a sample writing line (an average down stroke on Rhodia 80g High Grade Vellum Paper), to get the most accurate measurement possible. For each nib size, we measured multiple nibs from each brand, then took the average size, rounded to the nearest tenth of a millimeter, and used that number for the chart. Each number is an average nib tip size, and based on our current inventory. The numbers are accurate, but please keep in mind that there are variations in tip size. Therefore, this chart is best used as reference point and comparison tool. Also, as we continue to test our inventory, as well as expand and add new products and brands, we will continue to update this chart. If you have any questions or comments, please let us know! Keep reading below the chart for more information. Softer and/or larger nibs will allow for greater movement of the nib material, and therefore create more variation in line width when pressure is applied. Low quality paper and some inks can cause feathering or bleed through, which can affect your line width. Fountain pen nib manufactures typically allow a small deviation in tip size during production. Most of the fountain pen brands at iPenstore.com have very small deviation (0.01 mm or less); however some low cost and mass market fountain pens may have larger deviations, depending on the manufacturer. Italic and stub nibs create a wider line on the down-stroke, and a narrow side-stroke. These nibs will create beautiful line variation and add character to your writing. A true italic nib has a flat point, and straight, sharp edges around the sides of the nib. A stub nib is similar to an italic nib, but the edges are rounded, which makes writing with a stub much smoother and easier than a true italic. A ‘cursive italic’ is basically somewhere in between. Almost all factory produced italic nibs are actually stub nibs (even if they are marked as “italic”). Most fountain pen users prefer stub nibs over a true italic for everyday writing because they are much more forgiving and will generally glide smoothly over paper. True italic nibs can feel scratchy even on the best paper, and can be difficult to master without a lot of practice. However, many calligraphy artists prefer true italics because of the crisp lines and edges they can create. Calligraphy nibs can be italic or stub nibs, but depending on the manufacturer, they can be marked with an F, M, B just like a standard nib (some calligraphy nibs may also have a letter C before the nib size). Even though they may have the same lettering as regular fountain pen nibs, they are generally scaled differently than regular fountain pen nibs. The actual nib size and width will depend on the manufacturer and particular pen line. A medium calligraphy for one brand, may not be the same width as a medium calligraphy from another brand. Since the actual tip size may vary on calligraphy nibs from brand to brand, we try to include the size in the description of each particular item. 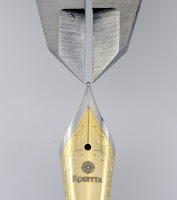 An "A" nib is typically sized between a fine and medium point. "A" nibs are considered to be ideal for new fountain pen users. The tip is slightly more round and smoother than a standard nib, and therefore more forgiving. The "A" comes from the word "Anfänger", which is German for beginner. Here at iPenstore, we have"A" nibs available on the Lamy ABC fountain pen, and Pelikan Pelikano fountain pen and Pelikano Junior fountain pens. Left handed nibs are usually marked with "LH", or an "L". These nibs will typically be the same tip size as a medium point nib, but the point is angled slightly to work better for left-handed writers. Some left-handed fountain pen users love them, others say the standard nibs sizes work just as well. Whether or not you'll use a left-handed nib may depend on your particular writing style. A music nib is basically an italic or stub nib, but with 2 slits for increased ink flow. The 2 slits double the amount of ink flowing to the nib, which creates a very saturated and wet line. The original purpose of a music nib is to assist in writing music notes - the wetter nib helps to quickly create note heads, while the stub shape assists in creating the stem and flag of a music note. At iPenstore, you'll find the "Zoom" nib on the Cross Peerless 125 Fountain Pen. The "Zoom" nib is like writing with a brush - holding the pen at a higher angle produces a finer line than when the pen is held at a lower angle. The “Zoom” is essentially a very flexible nib 18k gold nib that can produce beautiful calligraphy-like line variation when used properly. The Fude (pronounced FOO-day) nib is a curved calligraphy nib. We have Fude nibs available in the Jinhao brand, in both #5 and #6 sizes. The nib handles like a brush pen for calligraphy. The tip looks as if it is bent, but the nib allows for some incredible line variation depending on the angle of the pen. Writing at a 90 degree angle to the paper produces a fine line with the line becoming broader as you move towards a 30 degree writing angle. Nibs that are designated as flexible or soft will create line width variation depending on the amount of pressure applied when writing. Pressing down on the nib when writing will spread the tines further apart, resulting in a wider line. The most common flexible nibs are typically made out of gold (a much softer metal than steel). However, by increasing the size of the nib, or the length of the slit between the tines, manufactures can create flexible steel nibs as well. Flexible nibs (especially gold nibs) are typically not recommended for beginners, as too much pressure can easily damage the nib. 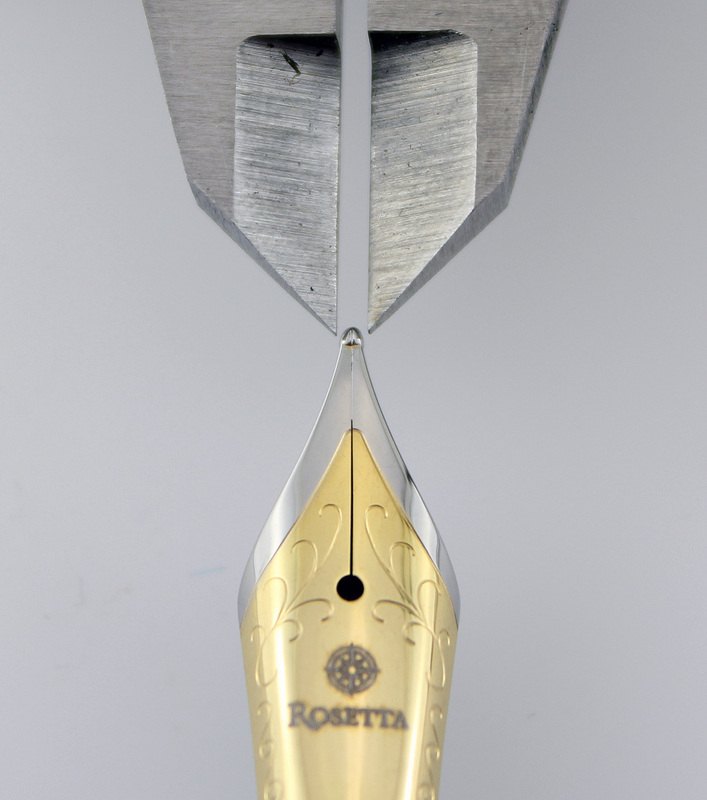 The tip of an oblique nib is cut at an angle. Oblique tips can be left or right, depending on the direction of the angle. The angle is designed to give a variation to writing lines, though it can not be as noticeable as most italic or stub nibs. An oblique nib can be fun to use, but typically takes a lot of practice because the pen has to be rotated just right to get the most out of it. Oblique nibs have become somewhat rare because they can be difficult to master, so most fountain pen users looking to add some character to their writing prefer a stub nib. Which nib is best for me? If you are new to fountain pens, we always recommend starting out with a basic steel, fine or medium point nib (or an "A" nib). If you typically write small letters, or characters with many small details, a fine or extra fine may be best for you. If you write big or generally have large handwriting, then you'll probably love a broad nib. If you want to add some character to your writing, try a stub or flexible nib! Being a fountain pen user means that you can change your writing experience every day by experimenting with various inks, paper, and of course different pens and nibs. There are many fountain pen options available, so check out iPenstore.com to find thousands of amazing items to choose from. If you have any questions on anything fountain pen nib related, (or if you want to share details of your favorite nib), contact us or let us know in the comment section below! Amzing post dear …………keep posting!